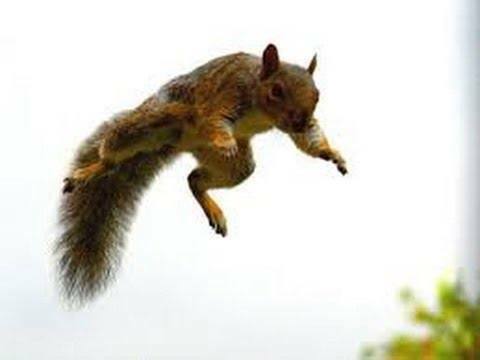 » How High Can a Squirrel Jump Off the Ground? In case you haven’t noticed, squirrels are amazing. Perhaps they are not given enough credit for all the qualities they embrace. If you take the time to sit quietly and watch them their behavior in their own habitat, you will find a smile fast appearing across your face. They are that entertaining. They are also incredibly intelligent creatures capable of some capers for survival. How much do you know about squirrels? Here are some interesting facts about squirrels to ponder on. Squirrels can jump at least five to six feet straight up from the ground. They can launch an amazing distance from a house, tree or any structure in Olympic form. It is effortless and smooth sailing every time. They will put on elaborate bogus food burying shows to deceive onlookers. They also conduct fake burials to trick potential thieves with the intent to convince other squirrels they have stashed their food stock somewhere else. Squirrels have been watched in what is called, “deceptive caching.” This is when a squirrel digs a hole and vigorously covers it up again, but without ever depositing the nut. Potential food thieves are encouraged to come take a look for that ‘buried nut’. Squirrels can smell food buried in over a foot of snow. They will dig a tunnel and follow the scent to the buried treasure, whether it is their food or another’s. Squirrels often lose over 25% of their buried food to thieves, usually other squirrels. These scurried, energetic mammals’ scatter their food everywhere. In fact, some have so many multiple caches of food; there is just no possible way for them to keep up with them all. Birds and fellow squirrels take advantage of this for a free meal. On the flip side, much of the food buried by squirrels doesn’t get found at all, resulting in new trees. They also have a ‘zigzag’ dance they engage in when they feel threatened. Squirrels will throw off predators by running away in a zigzag pattern. This useful strategy usually works well for escaping such hunters like hawks. Squirrels do their own twist on hibernation rules to prepare for winter. They will fatten up as much as they possibly can to stay warm during the winter. A newborn squirrel is about an inch long .If you come across one of these itty-bitty baby squirrels, please consult these resources, which will advise you what to do with these delicate new lives. Typically your local conservation organization will come to relieve you of the newborn squirrel. Did you know squirrels are so trusting that they are one of the very few wild animal species which will eat out of a person’s hand? Always show caution, they are known to bite if frightened. 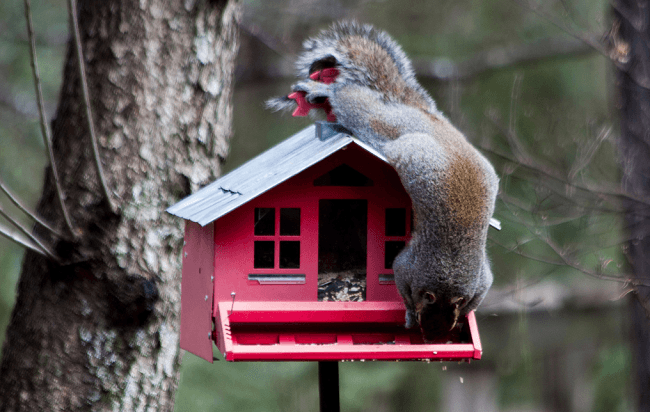 Squirrels are acrobatic, and adaptable. If you’re not convinced hang a bird feeder without these bandits giving you a challenge. In fact, they would love for you to put up a bird feeder, as they do not discriminate where their next meal is coming from. While this is cute and delightful to watch in the beginning, a squirrel will not attract birds to your lovely birdfeeder. Consider setting up a squirrel feeder across the yard. The squirrel will proudly accept this feeder as his own, and keep clear of your bird menagerie. As always, pledge to create a humane backyard. Whether it is your passion for birds or the entertainment of squirrels, always be aware of anything which could harm the wild furry or feathered friends which come to visit.